A sleek, long-lasting remake of a classroom favorite, the Bostitch Antimicrobial Manual Pencil Sharpener offers a new level of protection for students and teachers by incorporating antimicrobial technology. Built with classrooms in mind, the one-hand easy-turn dial accommodates eight different pencil sizes, while the oversized ergonomic Kid Grip is easier for students to grasp. Tip Saver technology extends pencil life by preventing oversharpening. Featuring all-metal construction and a die-cast metal base, this sharpener includes replaceable HHC2 dual cutters that last six times longer. The high-capacity shavings receptacle is easy to empty. The mounting base includes screws for permanent mounting, or table clamp hardware for temporary mounting. 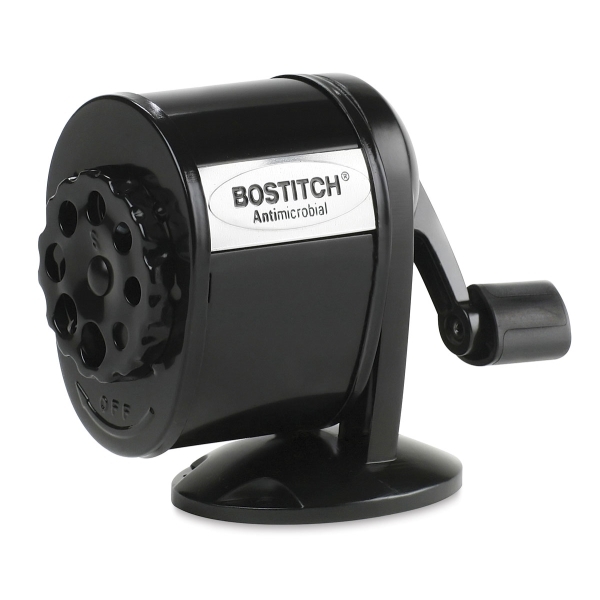 The Bostitch Antimicrobial Manual Pencil Sharpener is backed by a manufacturer's lifetime limited warranty. ® Bostitch is a registered trademark.™ HHC2 is a trademark. ™ Kid Grip is a trademark.